Being fortunate to be able to celebrate the anniversary of long years of our marriage, this Grandma appreciates what it took Grandpa and me to get here. I find it difficult, even after being considered by some among professional circles as an expert in Florida family law, to quantify what that means. There are many persons with whom we can develop a successful intimate relationship, but the selection process is most important. Mental and emotional health and welfare is a major initial consideration. Age, thus, is a factor to have enough life experience to be able to make the selection. Now the average marriage age for a woman is 27 and a man is 29. Entering marriage in the early thirties is even better. As more mature adults, the partners have a better chance to know who they are and to be able to identify an appropriate life partner. More adults who are college graduates in our country are marrying with a greater chance of success. The divorce rate is plummeting to 16% for this group, much lower than it was for Boomers who married earlier and 50% decoupled in the 1970’s and 1980’s. For Boomers, the divorce rate of those over age 50 is still hovering around 50% so we should show respect for and acknowledge those who make it! I have found that no two relationships are the same, which is why family law, my chosen professional field, is so interesting, and so challenging. Selection is complex, but there is a great book about the selection process, published decades ago but still worth reading, “The Good Marriage, How and Why Marriage Lasts” by Judith S. Wallerstein and Sandra Blakeslee. In the book, different types of marriages are identified and defined as romantic marriages, rescue marriages, companionate marriages and traditional marriages. In my experience, marriages are a fluid composition of all of the different types, almost like a lava lamp, depending on the intent and conscious decision making process or otherwise. But, somehow, those differences that seemed acceptable become amplified in a bad way after commitment, and these will always be a source of issues. It is not that the issues cannot be overcome, but additional issues and differences add to the difficulty and hardships to endure and experience on the way to a successful long term marriage. I think that societal changes that I have observed over my career impact and blur the boundaries of Wallerstein’s four types of marriages. Wallerstein also lists nine characteristics, identified as tasks or building blocks of a lasting marriage. This Grandma thinks that the nine include many subparts, making it seem that a successful marriage is even more difficult than it is. When you read Wallerstein’s nine, you will get a very good sense of the challenges faced by a lasting marriage. However, I, from my own experiences, think that the characteristics list can be simplified. What I now realize is that parents know if the selection by their child is flawed and how and why. As much as an adult deciding to enter into a marriage hates to listen, one’s parents’ opinion should be a factor in the consideration in the selection process. In the evolution of the definition of marriage and family, I think there are three major commitments that stand out in the successful long term marriages among us. The vows followed are the commitment to nurture oneself, the other partner, and the partnership, as three separate entities that must be balanced. The vows followed are the commitment to grow and change together, and to work to stay together, despite what life will throw at you, the “to have and to hold, from this day forward, for better, for worse, for richer, for poorer, in sickness and in health” part of the traditional marriage vows. But the greatest commitment followed is that both parties consider divorce as a very last option or not an option at all, the “until death do us part” part of the traditional marriage vows. This requires acceptance of the foibles and idiosyncrasies of our partner. It requires acknowledgement and acceptance that we cannot change our partner. It requires acceptance that we are the one we can control and change, and change we must, in thought and action, to adapt to the challenges of life as part of a marital partnership. The memories and history created by the commitments of those in a long term successful marriage sustain and nurture the marital partnership. Some might refer to this as knowing that your spouse is your best friend, knowing that this person was chosen as or to be your favorite person to hang with. There will be times where life interferes with intimacy. We have the same DNA as our siblings, yet we cannot always get along with our siblings. Why should we think that there will be no difficulty in the relationship with a spouse, a stranger with a different family culture, history and background? I recommend to anyone who will listen that there is an easy way to nurture intimacy. Because life interferes with intimacy, intimacy must be scheduled into the life of the relationship. My idea is, that, as soon as commitment has been made, the partners must schedule and plan twenty four hours away in three months’ time (four times every year). The location must be away from the home, with no electronics whatsoever. During the twenty four hours away, the next quarter twenty four hours are planned. How does this help? During the difficult times, we can know that we have something good to look forward to, a quarterly contract to reconnect, remember why we made the commitments, appreciate each other. I have seen it work. When a marriage hits a rough spot, going away once a month for a time, and after intimacy is restored, seeking interventions and therapies helps. 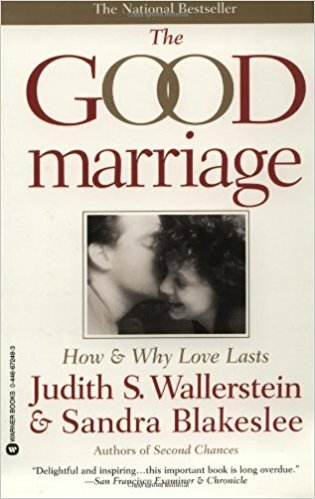 Wallerstein intertwines the challenges of marriage with the tasks of a successful long lasting marriage. I started this blog post by wondering about quantifying what it takes to have a successful marriage, how to weigh, for example, the nine tasks that Wallerstein identifies. Then, I realized that life challenges have been identified and quantified, in the Holmes and Rahe stress scale, a list of 43 stressful life events that can contribute to illness. On the Inventory, you will see that many of the listed life events are happy events. Many of the life events are sad. And, many of the life events are both happy and sad at the same time. See, post, “Why Life Happens With Tears and Life Happens With Laughter and With Knowledge Comes Power to Understand and Cope With Life’s Challenges,” for the inventory this Grandma thinks gives us a list of what challenges can happen and the consequences of those challenges upon us. A successful long term marriage meets the challenges and overcomes them. You might have realized by now that I did not mention love as one of the top four keys to a successful long term marriage. I heard this saying once which I have always remembered: “A successful marriage requires falling in love many times, always with the same person. On Google, I found that it is attributed to Mignon McLaughlin, an American Journalist (June 6, 1913 – December 20, 1983). This Grandma’s thesis is that a perfect marriage is when you are happy 70% of the time. How can you expect anything more than 70% is perfection as you are committed to a stranger, with, as said above, a different family culture, history and background. To see more of my thesis on social change, marriage and divorce and tips, you can watch a speech I gave for the Broward County Bar Association, at their Bench Bar Convention, October 18, 2013 at this link for my professional website. I suggest you watch it with one you love.